The history of the 20th century usually comes packaged in two parts. The post-war period after the end of the Second World War, and the earlier pre-war period. While the two are easily distinct there are also common threads that run through both of them and conceivably connect them into one whole. One such thread is an arms race dynamic. Most of the 20th century, beginning in the 1930s at the latest, along with our own time in the 21st, conceivably tells a story of a single uninterrupted arms race. Clearly, the timeframe of the Great War from 1914 to 1918 was a period of militarism and unprecedented global buildup of arms. It saw the rise of economic regimentation and the subordination of economic activity to the immediate needs of the state, as well as of the view that saw the usefulness of production primarily in giving a nation the ability to wage an extended industrial war. Following the end of the Great War military expenditure fell sharply and receded to levels that did not seem a cause for alarm. However, the experience of the war could not simply be erased. Even as the size of armies was reduced old thinking remained and influential circles continued to think of the economy as another branch of the armed forces. According to this thinking the usefulness of bountiful agricultural and industrial production lay primarily in the fact it granted a nation the ability to raise, feed, equip and maintain a military that was as large and as mechanized as humanly possible. This, the experience of the First World War had shown, was the first prerequisite to avoid national disaster and national humiliation, as had befell Germany, Russia, Turkey and Austria-Hungary. In this way even after the Great War had ended its shadow continued to loom, as its lessons continued to inform participants and non-participants alike. Japan for example had seen that a major cause of German defeat in the war had been its inability to feed its population from its own agricultural production. For all its industrial might Germany had in fact not been capable of an extended industrial war. Once the British established their maritime blockade and cut off Germany from its imports the populace of the latter had been placed on the path leading to slow starvation. The Japanese knew that being even less self-sufficient than the Germans, they were even more vulnerable to blockade than had been Germany itself. Being therefore categorically incapable of an extended war in a serious conflagration Japan was no true independent power capable of autonomous action on the world stage. To truly become such it would need to field a large, sophisticated army and navy, but also be able to produce, or extract sufficient quantities of everything it needed, whether it was foodstuffs, ore, oil or machinery, in the confines of its own borders. The quest for military power, was therefore inseparable from the quest for autarky. The Nazi quest for a Germanized East Europe that drove Hitler’s Germany to war and caused WWII in Europe itself is often explained as driven entirely by racist anti-Slavism and a thirst for territorial aggrandizement for its own sake, but this misses the point that it also made crude strategic sense. Albeit hugely unrealistic in the immediate, the fantastic Nazi goal of a network of German agricultural colonies spanning the Polish, Ukrainian and Russian plains seemed to offer the solution to the crucial problem of German military might and great power status. Being able to grow its own food Germany would have come close to achieving autarky and would have finally made itself invulnerable to blockade. Given the prevalence of such thinking, informed by the most immediately obvious lessons of World War I, it was not surprising when in the 1930s a general arms buildup began anew. The Soviets, spooked by Japanese moves in the Far East responded with a massive investment in arms. In 1929 the Red Army had 90 tanks, in 1933 the figure was 4,700 instead. The Japanese were determined not to be left behind, but to maintain parity with the Soviets, and the first great power arms race in the post-Great War period was on. Soon thereafter European powers followed with an arms buildup the contemporaries knew as “rearmament”. Whereas in the 1920s Europeans had downsized their armies and cast away much of their arms, they would now undertake to arm themselves on a massive scale for the second time in the century. A general great power arms race was now on, which continued through WWII, as well as afterwards in the form of the Cold War-era arms race between the two superpowers, and which in a very real sense has never let off since. One difference between the First and the Second World Wars was that in the former small powers could still hope to be able to defend themselves on the open field. The best example is offered by Serbia which remained in the war for more than a year after the initial attack by the Austrian-Hungarian Empire, and inflicted a series of embarrassing defeats against its invasion forces in large scale conventional battles. In the end it took a joint offensive by Austrian, German and Bulgarian forces to send the Serbian government and army into exile. However, if the First World War indicated a small power could still conceivably resist a great power it also showed it could only do so at a huge, crippling cost. Having traded blows for so long in a great power dispute, Serbia came out of the war as the hardest hit country, with the greatest per capita loss of life of all the belligerent powers. There was no magic formula to the success of the Serbian resistance to the Austro-Hungarian Empire in 1914 and 1915. The kingdom was able to initially repel the Austrians because it had quickly subordinated everything to the conduct of the war and had mobilized every resource of the peasant nation for defense. It had effectively adopted the notions of total war early and to its full extent. However, once everyone was willing to run the same distance and mobilize just as thoroughly the only thing that still mattered was the nation’s overall potential. The belligerent great powers, however, entered the Second World War already mobilized, having pursued militarist policies of arms buildups and the regimentation of society since at least the mid-1930s. As a result the only role that was left for the small powers to play on the open field was that of auxiliaries such as Hungary or Romania, or of quickly dispatched victims such as the Netherlands or Yugoslavia. In fact there had been those who had predicted this in advance and had acted accordingly. Interwar Denmark, for example, declined to even entertain the notion of being able to repel aggression by Germany. In a conscious policy of appeasement its government did not invest in the armed forces hoping this would spare it conflict with its great power neighbor. When in 1940 the Germans invaded anyway, the Danish government surrendered on the same day so as to spare itself and its populace the cost of futile resistance. More surprisingly, the Second World War showed that at some point of general militarization not even the medium powers had a real chance of successfully facing off against powers with greater potential. Powers such as Poland, Italy, Japan and even France were all knocked out from the war in a campaign that was brief (Poland, France), or else in one that albeit seemingly drawn out never truly caused a serious crisis of confidence with the opposition (Japan). Japan, for example, did not capitulate until August 1945, but on the other hand, discounting the first six months of the war after the surprise strike on Pearl Harbor, the United States held the initiative the whole time. Therefore as long as the Americans were willing to bear the kind of casualties needed to bring about a comprehensive Japanese defeat the outcome of the contest was never in question. In a very real sense a power like the 1940s Japan, or Italy was a minnow compared to the likes of true industrial behemoths such as the United States. Italy admitted this far earlier in the conflict and capitulated in 1943 already, while Japan soldiered on for two more years. At the end of the war the Italians could consider themselves the luckier of the two having lost 1% of their entire population to the war, to Japan’s 4%. Having learned the lesson, post-WWII there were precious few states left that would engage in an arms buildup against the superpowers meant to underscore their status as true independent powers fully capable of autonomous policies. Even relatively potent military powers such as the nuclear-armed France and Great Britain invested in their armed forces solely for the purpose of being able to reinforce the United States in an eventual hot war with the Warsaw Pact, or else to maintain the ability to fight when and where the US allowed them a free hand. However, neither would have dreamed of unapologetically using military force to pursue policy goals which did not meet with Washington’s approval, as had done a substantially weaker Japan in the 1930s. In essence then the global arms race which had restarted in the 1930s continued through WWII and into the Cold War. Along the way, however, participants were dropping out. If in the First World War even small powers could — for a time and at a great cost — hope to underscore their independence against great power ambition with a force of arms, by the Second World War it seemed even medium powers had little business raising their heads from under the table when true behemoths fought total wars. As a result post-1945 the race now only had two autonomous participants, namely the United States and the Soviet Union — the two remaining powers which still refused to accept existence in the shadow of another. The militarists who moved to establish greater control over production in the 1930s did most definitely not underestimate the importance of a vibrant economy. Hand in hand with seeing the productive capacities of a nation as another branch of its armed forces went the desire to see them expand as rapidly as possible. The arms enthusiasts were perfectly capable of demanding that resources should not only be spent on arms, but also reinvested into new plants and infrastructure. It was the case, however, that they refused to admit that central control, which was so useful for military procurement, was not conductive to economic growth. In the West there remained some understanding of the long-term downside of economic controls, but even there governments were at a loss to come up with an alternative to increased authoritarianism in economic affairs, which seemed as the only one course of action capable of preventing falling behind in the arms race in the short term. Even as the Soviet Union dropped out of the arms race, and went on to voluntarily dissolve, this failed to have a truly significant impact on the scale of military procurement in the United States. In terms of inflation-adjusted per capita spending Washington today actually spends more on its military than it did during the Detente period of the Cold War in the 1970s. Even as every other power has lost the taste for it realizing it could never match the nation with the greatest war potential, the latter persists in running in the arms race alone, seemingly against itself. As always there are exceptions, or one exception in this case. The Democratic People’s Republic of Korea. The one small power that would not give up the arms race. With its one million strong standing army, this country of 24 million has unflinchingly followed through to the logical conclusion of total war thinking. DRP Korea is the one country which truly has conscripted every resource within its borders for the express purpose of enhancing its military might and independence — and has paid a terrible price for it. It presents itself as a self-sufficient and self-confident power ready to throw itself against the superpower still parked south of the DMZ at a moment’s notice, and it could conceivably prove most unwise to ever doubt its stomach for a fight. Even so one does not have to look far to see just what the militarist state policy underscoring this attitude has cost its citizens. The result of persisting in such an ambitious arms buildup for so long has been economic stagnation and perpetuation of police control over society. Internal regimentation that has enabled Pyongyang to capture the maximum extent of the nation’s resources for the creation and the maintenance of a gargantuan centrally-controlled military force, has also sucked out the life of its people. In the medium and the long term it has also deprived it of economic dynamism so that its industrial output is now considered tiny and that it is able to make only unsteady and uncertain technological progress. The tone of North Korea-related news coverage ranges from musings about the technologically backward and decrepit state of its military, to eery fascination with the system of totalitarian police control its citizens are subjected to. In whichever case DPR Korea is depicted as a state that is not merely atypical, but outright bizarre. Supposedly it is a power that is completely beyond comprehension, and may perhaps only be explained by the craziness, or the evilness, of its leaders, or its state ideology. In fact most aspects of North Korea may conceivably be explained as stemming naturally from its categorical refusal to admit the futility of its arms race against its more powerful enemies. Whether it is its blustering posture, its fixation on autarky, its failure to enact economic liberalization or its regimentation of society, they all make perfect sense even without a reference to Communism, Juche, or the “crazy” Kim dynasty. Such is the logical outcome of a prolonged and extreme effort to bolster centrally-directed military might and the associated deterrence capability of a nation. Its social and economic controls, extreme as they are, nonetheless offer a picture of what any state engaged in a similarly determined effort to raise and maintain readiness for total war will be naturally gravitating toward. Yet, in a certain sense North Korea is not the abnormal country here, but on the contrary the last small power to insist that its external freedom does not exist at the whim of a great power, but is underlined by its own force and the readiness to employ it. Before the notion of overriding decisiveness of military potential had really sunk in, as the main lesson of the age of total war, this would not have had raised too many eyebrows. 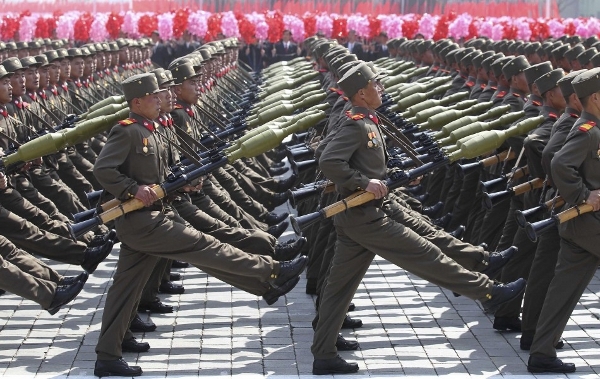 In an age of industrial total war North Korea, so as not to have to capitulate in a confrontation with a belligerent superpower, maintains a gargantuan army and a combative attitude. This has let it remain free of American hegemony, which stops south of the DMZ, but is taxing its people to a ruinous extent. If such trade offs are worth not having to back down before the United States of America is for the North Koreans alone to decide. As for the rest of us, it should probably leave us attempting to figure out if there is not a hypothetical order under which a small nation could resist hegemony from the outside, without having to inflict on itself self-defeating and ultimately futile masochism from within. An order perhaps, which would not rest on a military force that was centrally controlled and separate from society, but that was instead organic to it. Such that it could grow potent without invasive intervention into the economy and the associated strangulation of economic and technological advancement in the long term, for the sake of military procurement in the short. An order perhaps, without a state. The United States of America went through its own profound crisis caused by its militarism during the American War in Vietnam. The fiscal crisis caused the US to abandon the Breton-Woods monetary order, and the moral crisis resulted in the US being forced to move away from its mass-mobilization land army and transform it into a smaller, more limited force that was less suited to wage apocalyptic war with the Soviets on the North European Plain.